Denyse Schmidt provided one of my earliest introductions to the modern quilting movement. I love that she derives inspiration from vintage quilts and designs since these are dear to me already, but she cleans them up for the current quilter so that things look both familiar and fresh. I've given away some of the craft and sewing books that I've accumulated over the years but Denyse's first book, Denyse Schmidt Quilts, is still on my craft bookshelf and is still one that I consult for design inspiration when I'm coming up empty. Denyse has a new book out now titled, Denyse Schmidt: Modern Quilts, Traditional Inspiration, and I'm finding it equally inspiring. In this book, she shows off a new gamut of wonderful quilts and goes into more detail about her personal background and how she came to quilting and fabric design. She writes in such a quiet and contemplative way, reminding me that quilting at its best isn't meant to be down in a hurry to crank something out. I do need reminding of that sometimes. If you'd like to win a copy of this lovely new book, please just leave your comment below or on the corresponding Facebook post. Entries will close next Tuesday, 5/1 and we'll announce a winner on Wednesday. 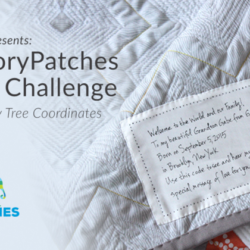 Good luck, quilters! The winner of last week's giveaway of our advance copy of Hat Shop was Maureen Betita–congratulations, Maureen! I would love to win a copy of Denyse Schmidt’s book!!! I love all of her work and her fabric too!!! I have Denyse’s first book. And I would absolutely LOVE to add her second one to my collection! Thank you for this opportunity, Spoonflower! Really, really need this book! It’s on my shopping list! I would love to win this! I was so sad when my dad told me that she was doing a book signing/meet and greet about it the day before I arrive in KC to visit family in late May (at a shop somewhere in Overland Park, KS, May 17, if you’re interested…). She is also so inspirational and this book looks no different. It would be lovely to win! I love her first book! I saw a show of some of her quilts in bridgeport, ct last year and it was inspiring and full of unexpected cloth contrasts! Denyse is such an inspiration! I can’t wait to own a copy of her book!! Gorgeous and inspiring book by a very inspiring artist, and I would love to win a copy. 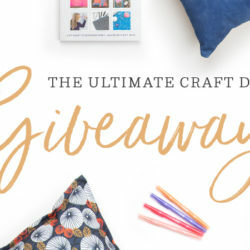 I’d love to win this prize, I’ve only recently started quilting and feel like I’m starting to get tired of traditional designs. This is exactly what I need! Ooh! This would be a good complement for my collection of 1970’s quilt books. I would LOVE to have this book, being a huge fan of Denyse’s. I already want to make the Whisper quilt in the book. I’d be thrilled to get a copy of this book! I’m glad I’m not the only one who needs occasional reminding that the goal of a quilt is not just to “crank it out” as fast as possible! I’m a Denyse Schmidt virgin! I’m a relatively new quilter and have been getting so frustrated at the dated books available. This would book would be absolutely amazing and remove all my frustrations in one go! Denyse Schmidt is my quilting inspiration. I’d love to win. This looks like great fun – and an approach at the right speed. I’d love to add this book to my library and share it with my Modern Quilt Guild. This is already on my wish list- I’d love to win! Thanks so much for the chance! Oh, yum, I’d love to have this book! Would love to win a copy of the book!! Like you, I missed out on Flea Market Fancy the first time, but not the second time! I’d love to have this book to go along. Thanks for the giveaway. Another lovely giveaway. I would enjoy this book a lot, I know. Wow, what a great sounding book, exactly what I have been looking for. I’d love to get into quilting with a modernarty twist. I’m seriously considering making a quilt with all of my Spoonflower samples and I think this would give me the motivation (and technique) that I need to get started. I would be so HAPPY to win this book! I am a huge fan of Denyse Schmidt! I want it ! Please. I love her work but I have yet the chance to pick up any of her books. This would be a great start for my collection! Denise’s book looks positively divine. Would love to lay my hands on it! Thanks for another great giveaway. Yet another reason to like Denyse Schmidt! You can never have too many craft books. Count me in! A newbie quilter here but this book sounds amazing. I have a trunk full of fabric scraps collected from friends and family. Winning this book would be the perfect excuse to get stated on the quilt I’ve always wanted to create. What inspiration! I would love to win this new book. I’d be interested to read more about the influence of traditional quoting on the morn quilt movement. Thanks! Ooh, I’m a brand new quilter and would LOVE a book with such beautiful, modern book! Thanks for the opportunity to Win Denyse Schmidts new book. What a great prize!! I’d love to win this book. It looks awesome! Thanks for the chance. I would love to win this for my quilting mom for Mother’s Day! I’ve admired Denyse Schmidt’s work for quite a while, and it’d be great to win this book. She’s a fabulous designer! I am so grateful I got to do one of Denyse Schmidt’s workshops. It was a great, creative experience. I have her first book and would love to add her second to my library! I love the design process of quilts, and would love to add this to my inspiration collection. I’m not much of a quilter but keen to learn! 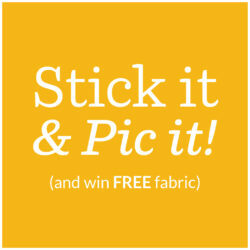 I am a new quilter and i would love to win this book! Looks like a great book. Need lots of new ideas. I have Denyse’s first book and enjoy it. I’d love to have this one, too. Thanks for the giveaway! I have been quilting for 8 years and have not crossed paths with Denyse. I am always interested in “fresh” ideas! I will keep my eyes open for more from this lady. I would love to win this book to get to know her style! Looks inspirational, it would be great to have it. I would SO love to have this book in my hot little hands! I pieced my first quilt last week, and already made a second one. I think I’m hooked, so having a book like this would only further my addiction. I would love to win this book. Just took a class on building tesselations, for my spoonflower fabrics. This would be a perfect read! thanks for the contest and considering me. Sounds great! Would love to use this book for a few projects. I am a huge fan of Denyse Schmidt quilts! I own two and have given them as gifts. Her refreshing take on the classics have inspired me, a non-sewer, to grab my daughter’s sewing machinge and a couple of simple patterns to try my hand … so far so good! I’ve made a baby quilt and some eye-pillows for my yoga students, and would love to win this book so I can keep going. Thanks for the opportunity! I’m a Denyse Schmidt fan. This book is meant for me! I bought some of the original Flea Market fabric & was delighted when the second run came out. Have the first book which is awesome & know this one will be too. Thanks for the opportunity to win it. Please pick me — I will share it w/ my daughter. Oh how awesome! Even just the cover is inspiring, I can’t imagine all of the quilty goodness that’s inside. Crossing my fingers! This one needs to come home with me… there is a spot on the shelf RIGHT next to DS Quilts. Yes, and thanks! « Fabric8 contest is now closed for entries!